Rarely does a product placement catch my attention and shatter everything I have come to know about shopping for watches. In one of the opening scenes of the new Netflix film titled ANON, as Clive Owen is walking down the street past a Jaeger-LeCoultre store playing a not-so-distant future detective who is equipped with some kind of augmented reality ocular implants which apparently everyone uses in the future …you know, because who doesn't want electronic hardware implanted in their eyeballs? But I digress... As he is about to have his first encounter in the movie with co-star Amanda Seyfried, he passes a Jaeger-LeCoultre store window. His attention is then caught by some absolutely stunning JLC watches as you can see in the image below, most of them appears to be from the Master Control series. This is not that surprising since the Master Control collection is possibly some of their best watches ever yet most of the watches that you see and head about are the JLC Reverso watches since it's possibly their most iconic watch. Ironically, their most iconic watch is nowhere to be found in this display. As if to say "Hey people, there are more impressive things from JLC than the Reverso, come check it out!". Next is where all the magic happens. Firstly, the AR ad properly pronounces the Jaeger-LeCoultre brand name in its original French pronunciation and for all you arguing over this it's pronounced "jay-JAY leh COOL-treh" (case dismissed). He then looks at the store window and you notice that his vision is overlaid with data on each watch including the name of the watch and model number. Then he finds one watch that catches his eye; the Jaeger-LeCoultre Master Geographic reference #1428421 in stainless steel with a silver dial on a black alligator leather strap. Since the film didn't give much time to check out the beauty of the timepiece, we made a more resolute version available on the image below and from the looks of it, Clive Owen has some nice taste! 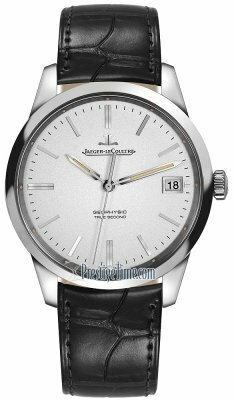 "The Master Geographic is one of the flagship timepieces of the Jaeger LeCoultre line. The elegance of its stainless steel casing is surpassed only by its practicality. A perfect fit for the world traveler, this piece tells the time in any one of 24 destinations around the globe-at-a-glance. Water resistant to 5 atm/165 feet. The unique movement is automatic, self-winding, made of 310 separate pieces. Vibrations per hour: 28,800. 43 hour backup-battery. Leather strap, double folding buckle 16mm. Jaeger-LeCoultre Calibre 939A." It also showed the JLC logo and a SKU number of "AP-LM-132732-93". Now, as far as how much of this stuff is CGI and how much is actually possible with today's AR technology…I would leave that to the geniuses behind the viral Pokemon GO app that made the application of this technology mainstream. But wouldn't it be cool if this is what the future looks like? At least in terms of shopping? This wouldn't be the first time a JLC braced the wrist of Hollywood actor Clive Owen. As a brand ambassador to JLC he has had more than several. But in all seriousness, could we have just exposed the future of shopping? Is this where it's all headed? Jaeger-LeCoultre is known for doing quite a few product placements in some major films. One of the most recent was Marvel's Doctor Strange which featured another JLC watch, the Master Ultra-Thin Perpetual. 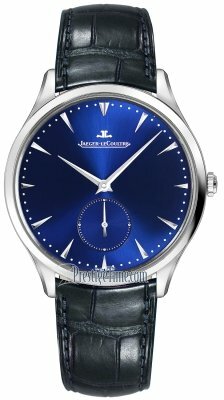 JLC is a historically rich, yet future-thinking brand. Certainly, their marketing team feels the need to imply this with their choice of films and history proves this to be true. What are your thoughts? Would YOU ever shop for a JLC watch this way? If not you can click here to shop the normal way.